3. Pumps carry the fuel and oxidizer. 4. The combustion chamber mixes and burns the two liquids. 5. The hot exhaust is choked at the throat, which, among other things, dictates the amount of thrust produced. 6. Exhaust exits the rocket. Ignitable, self-sustaining solid fuel/oxidiser mixture ("grain") with central hole and nozzle Simple, often no moving parts, reasonably good mass fraction, reasonable Isp. A thrust schedule can be designed into the grain. Throttling, burn termination, and reignition require special designs. Handling issues from ignitable mixture. Lower performance than liquid rockets. If grain cracks it can block nozzle with disastrous results. Grain cracks burn and widen during burn. Refueling harder than simply filling tanks. Separate oxidiser/fuel; typically the oxidiser is liquid and kept in a tank and the fuel is solid. Quite simple, solid fuel is essentially inert without oxidiser, safer; cracks do not escalate, throttleable and easy to switch off. 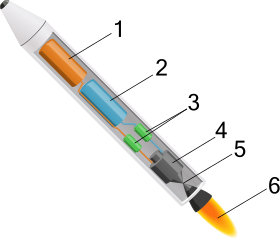 Some oxidisers are monopropellants, can explode in own right; mechanical failure of solid propellant can block nozzle (very rare with rubberised propellant), central hole widens over burn and negatively affects mixture ratio. 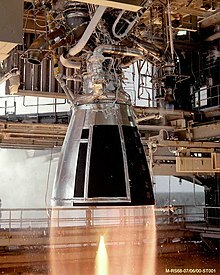 Two fluid (typically liquid) propellants are introduced through injectors into combustion chamber and burnt Up to ~99% efficient combustion with excellent mixture control, throttleable, can be used with turbopumps which permits incredibly lightweight tanks, can be safe with extreme care Pumps needed for high performance are expensive to design, huge thermal fluxes across combustion chamber wall can impact reuse, failure modes include major explosions, a lot of plumbing is needed. A combined cycle turbojet/rocket where an additional oxidiser such as oxygen is added to the airstream to increase maximum altitude Very close to existing designs, operates in very high altitude, wide range of altitude and airspeed Atmospheric airspeed limited to same range as turbojet engine, carrying oxidiser like LOX can be dangerous. Much heavier than simple rockets. ↑ George P. Sutton and Oscar Biblarz (2001). Rocket Propulsion Elements (7th ed.). Wiley Interscience. ISBN 0-471-32642-9. See Equation 2-14. ↑ Dexter K Huzel and David H. Huang (1971), NASA SP-125, Design of Liquid Propellant Rocket Engines Second edition of a technical report obtained from the website of the National Aeronautics and Space Administration (NASA). หน้านี้แก้ไขล่าสุดเมื่อวันที่ 19 เมษายน 2562 เวลา 07:26 น.